The world phenomenon of the penguin parade, interaction with native animals and some great fun will give you a day of nature-based experiences combined with the delights of Phillip island. This is Phillip island at its best ... An all-inclusive grand tour that is designed to give you the ultimate experience of Phillip island and the penguins. Sunset at Summerland Beach on Phillip Island has drawn millions of visitors. 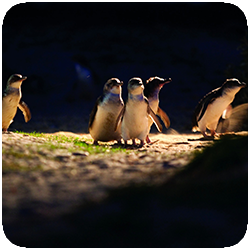 Each night these little flightless birds come in from the ocean to return to their burrows. Note: Please bring warm, waterproof clothing as nights can be cold on the island in any season. The Penguin Parade is a natural phenomenon taking place in the open outdoors.